It seems like it takes forever for the trees to shed themselves of their leaves in Texas. Our trees like to shed leaves in spurts. As soon as you clean up one bunch, another batch falls. That seems to be symbolic of my life recently. Instead of passing through “seasons” of life… I’m merely shedding leaves a batch at a time. It’s incredibly frustrating. I’m the kind of woman that’s driven and motivated. Once I have a goal set, a plan in place, and all the means to accomplish it, I’m ready to be at the end. I want to skip the marathon and sprint across that finish line, break that ribbon and get handed the trophy of accomplishment. I know a lot of women like me. And I would say we are all missing the scenery by not enduring through the marathon portion. We are missing an awful lot of God’s beauty and creation by trying to skip the hard part of holding on to hope with our longing. I hear this desire to “be there” echoed in other women as they announce, “Once I’m finally finished with school my life will begin!” or “When I finally get my own place I’ll have so much more freedom.” Or “I’m tired of being engaged. I can’t wait to get married.” What’s funny about all of these desires is they all lead to another ‘start’ we will soon want to skip through to be at the beginning of something else. How weary we grow of raking leaves. We want it to be summer again! How much life are we missing in-between? Why do we dread the in-betweens? Where have I put God? Stuffed Him under a pile of clothes. I guess it feels easier to stuff the hope God offers in the moment and reach for a tangible stepping-stone. But every moment I’m away from His word and guidance is misery. The idea of hope is terrifying because it means we don’t see the ending yet. To hope means to accept that we are longing for something not yet accomplished. We are living in faith that our hope will never fail if it is placed in Christ. That seems wildly impractical to me sometimes. Why invest in something risky I can’t control? Jesus knew when He died for us that we could choose to not put our trust in Him. He knew our hearts would harden and rebel. We were a risk. And yet He invested in us. He gave up His life for ours. He proved faith in Him is secure by rising from the dead and living again! He offers us life despite our tendency to try to live independently of Him. I am reminded that placing hope in Him is a daily surrender. It is a daily choice to invest my life in His eternal glory instead of mine. I have to realize that if anything I do results in His worship, it is because it was done In Christ and and In His strength. I want to see Jesus in my in-betweens. I want to see God’s magnificence as I’m raking the leaves. I don’t want to miss the beauty of holding on to hope. 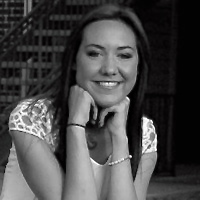 Anna Hull is a recent graduate of Schreiner University with a B.A. in Religion & minor in Political Science. Currently pursuing her M.Div in Theological Studies through Liberty University, Anna believes in rich authenticity, celebrating beauty, and saying yes to unexpected adventures. Anna loves Jesus and spending time with her family. Anna thank you for this reminder to embrace the in-betweens. The older I get, the more I am convinced there is something truly sacred about that space! Anna, I love your analogy of shedding leaves. You offer me a call to “embrace the in-betweens”, the places I too avoid with projects and busyness and anything that takes me away from waiting. Your comment about me being a risk has tunneled deeply into my heart this morning. I talk often about the risks I need to take. I hadn’t taken time to realize I am a risk and Jesus chose to die for me anyway. He took a risk for me. Those thoughts will be a good place for me to ponder today as I begin preparations for tomorrow’s special day. Thank you, Anna.